Happy National Watermelon Day! This is no joke. 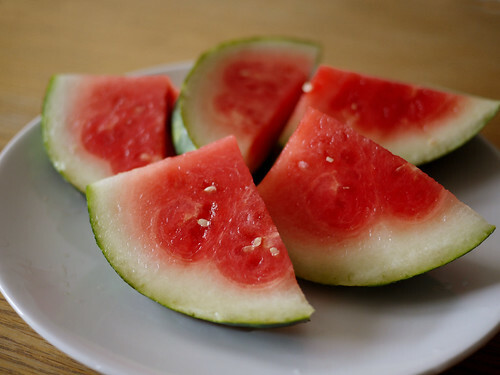 I actually found out there was such a thing and bought a small watermelon from the greenmarket on my way to work. I do love me some sweet watermelon, but if it's not really crisp it makes me nauseous, so rarely do I buy a big watermelon for the fear that it might not be right. This one probably costs as much as a big one in a supermarket, but I knew it was going to be good from the samples, and I feel good for supporting local farms. I really can't keep up with all these "national so-and-so days". It turns out I missed out on National Ice Cream Sandwich Day yesterday.